We investigated the association between mycophenolic acid (MPA) pharmacokinetics and organic anion-transporting polypeptide (OATP/SLCO)1B1, 1B3, 2B1 and multidrug resistance-association protein 2 (MRP2/ABCC2) genetic polymorphisms and diarrhea. Eighty-seven renal allograft recipients were given repeated doses of mycophenolate mofetil every 12 h at a designated time (09:00 and 21:00). The pharmacokinetics of MPA were analyzed on day 28 posttransplantation. The dose-adjusted area under the cuve (AUC)6–12 of MPA, an estimate of enterohepatic recirculation, was greater in SLCO1B3 T334G GG (or G699A AA) carriers than in TT carriers (or G699A GG) (40 vs. 25 ng·h/mL per milligram, respectively, P = 0.0497). 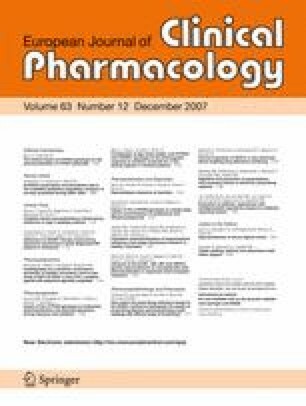 None of the polymorphism of SLCO1B1, SLCO2B1, or ABCC2 C-24T were associated with MPA pharmacokinetics or diarrhea. However, the oral clearance of MPA in recipients having both the SLCO1B3 T334G GG genotype and the ABCC2 C-24T T allele was significantly lower than in patients having both the SLCO1B3 T334G TT and ABCC2 C-24T CC genotypes (0.15 vs. 0.18 L/h per kilogram, respectively, P = 0.0010). MPA excretion into bile in patients with SLCO1B3 T334G GG (or G699A AA) was higher than in those with T334G TT (or G699A GG), probably resulting in a higher AUC6–12 value of MPA. MPA uptake into hepatocytes and excretion into bile at first pass may be greater in SLCO1B3 T334G GG carriers than in TT carriers. In addition, the ABCC2 C-24T polymorphism also seems to be associated with enhanced enterohepatic circulation of MPA. The SLCO1B3 and ABCC2 transporters rather than uridine diphosphate-glucuronosyltransferase (UGT) may partly affect interindividual variety in plasma MPA concentration. This work was partly supported by a grant (No.18923015) from the Japan Society for the Promotion of Science, Tokyo, Japan, and Novartis Ciclosporin Pharmaco-Clinical Forum Research Grant 2007, Tokyo, Japan.